The growing influence and interaction between communications, especially the printing press and foreign travel, reinforced the cosmopolitan culture that came to characterise the processes of the European courts. Lisbon took the lead, when, under the reign of the King João V, Absolutism gave the Portuguese monarchy a renewed lease of life. Sacred and profane music, heard either at the Patriarch or at court, had a strong political meaning and reinforced the king's aura of majesty. King João V, therefore, commissioned artists such as Domenico Scarlatti; built the monumental Opera House next to the Royal Palace in 1754 (destroyed during the earthquake of 1755), and enlarged the Royal Orchestra with new foreign soloists. 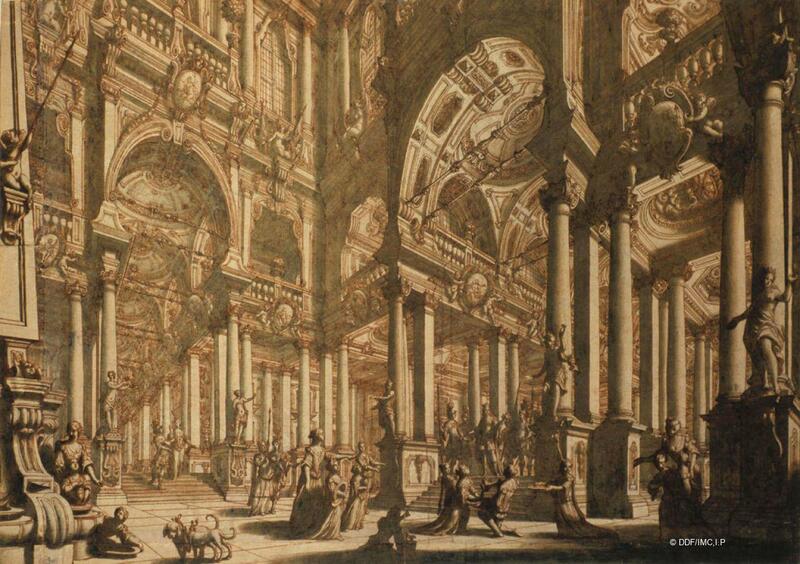 The theatrical scenery drawings of the Galli Bibiena family were not made on durable material. Due to the fact that the theatre sets they designed for court functions were temporary, few of their creations have survived. The richness and splendour of their stage sets can however still be judged from contemporary drawings, preserved in great numbers, and found mainly in collections in Vienna, Munich and Dresden. This drawing by Francesco Galli Bibiena is a study for an unknown stage set. It is possible that it was brought to Portugal in 1750–1751 by his son, Giovanni Carlo Sicino Bibiena (1717–1760), who was charged by King José I to modernise both the theatres themselves and their services. The drawing shows an interior space with large arcades seen from a diagonal perspective. The composition is dominated by two large arches leading up to corridors at the top of a staircase. The vaults are richly decorated and the balconies bear several medallions with mythological figures at the centre supported by little angels. Bound by columns and female sculptures, the central area is occupied by women with children. Two dogs can be seen on the left. Through the main arcade a young crowned ruler makes his entrance surrounded by soldiers carrying banners, attracting everyone's attention. This drawing by Francesco Galli Bibiena is a study for an unknown stage set. It represents an interior space with large arcades seen from a diagonal perspective. The vaults are richly decorated and the balconies bare several medallions with mythological figures at the centre supported by angels. Stylistic approach to the graphical work of Francesco Galli Bibiena. 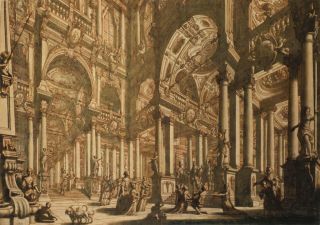 The drawing might have been brought to Portugal by Giovanni Carlo Sicino Bibiena in 1751 or 1752, along with some others. There is little information about the whereabouts of these drawings during the second half of the 18th century and the beginning of the 19th. In around 1845 the drawing was in the collection of the Royal Academy of Fine Arts, Lisbon and then transferred to the Museu Nacional de Arte Antiga in 1884, the date of its establishment. Correia, J. M., da Silva D., "Teatros Régios do século XVIII – algumas considerações acerca dos desenhos da colecção do Museu Nacional de Arte Antiga", Boletim do Museu Nacional de Arte Antiga. Vol. V, Nos 3 & 4, Lisbon, 1969. Beaumont, M. A., "Stage-sets by the Bibienas in the Museu Nacional de Arte Antiga, Lisboa", Apollo, 1973, pp. 408–415. Muraro, M. T., Povoledo, E., Illusione e Pratica Teatrale - Proposta per una lettura dello spazio scenico dagli intermedi fiorentini all'Opera comica veneziana, Venice, 1975. Desenhos dos Galli Bibiena. Arquitectura e cenografia / Eighteenth-Century Scenic and Architectural Design, Lisbon 1987; USA, 1990. I Bibiena, una famiglia europea, Bologna, 2000. Regina Peixeiro is an Art historian and the Curator of Prints and Drawings at the National Museum of Ancient Art, Lisbon.